PMBComments: On the State of Venezuela's Democracy: Jan 11/05 - On easy access to Venezuela's airports...for drug traffickers! 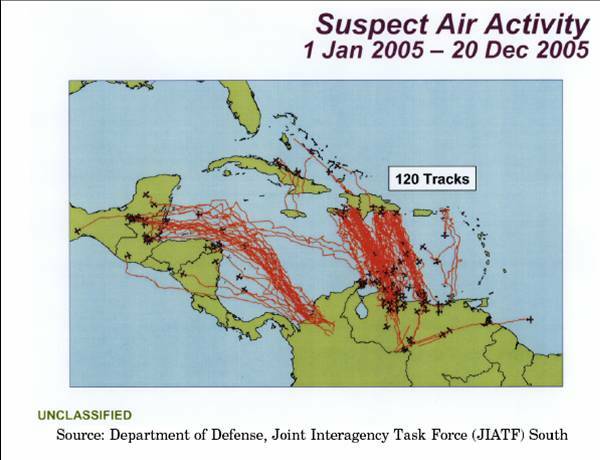 Jan 11/05 - On easy access to Venezuela's airports...for drug traffickers! PMBComments: the Committee on Foreign Relations of the U.S. Senate has released an insightful and information-filed staffer’s trip report to Colombia. The trip was taken by Carl Meacham at the request of the Committee to evaluate all aspects of Plan Colombia. While the report focuses on activities within Colombia, it touches briefly – and graphically - upon the latest information on the role Venezuela is playing in the international narcotics trade. While there have been a number of reports in the press of increased production in Venezuela, one of the charts in this report – see above - substantiate increased air activity from Venezuela towards Hispaniola (Haiti/Dom. Republic) - well know intermediate step for drug flowing into the U.S.